First of all, I did not make this lasagna for dinner tonight! LOL It takes way too long to make on a work night. 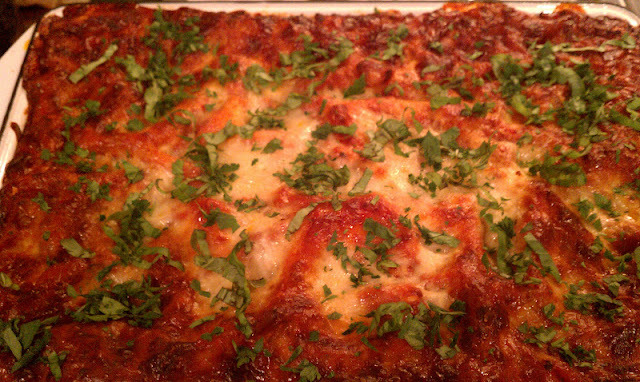 But I wanted to share my lasagna recipe -- this is the lasagna I made for Christmas this year. I have made and modified many different lasagna recipes over the years...and I must say, I think this is one of my best! Also, some lasagna recipes, including the one that I re-worked here, have directions that are just plain horrible and tedious to follow, particularly when it comes to assembling the lasagna. You have to go back and re-read them over and over again as you assemble the layers. Well, that all ends here with this recipe. This recipe is clear and concise and easy to follow. I will say, though, that it is a bit more time consuming than other recipes because you are making your own meat sauce instead of just using a jarred sauce with ground meat (not that there is anything wrong with doing that at all). My suggestion to make it easier for you on the day you actually plan to cook and eat it would be to make your meat sauce ahead of time, either the day before or a couple of days beforehand. Making your sauce ahead of time would greatly reduce your prep work and prep time on the day you actually assemble, cook and serve it...and that is always a good thing! One last thing...most lasagna recipes call for using a 9x13 inch casserole dish or pan, which can be used. However, I do believe that if you use a basic 9x13 inch baking dish, that it will very likely bubble over into your oven which I absolutely can not stand. My suggestion would be to use either a deeper lasagna dish or pan , or you could use a stainless steel roasting pan that was approximately 9x13 or larger to put your lasagna in (I used to use a roasting pan that was approximately 10x15 that worked perfectly). If your pan is slightly larger, then just add a couple of extra noodles to each noodle layer (there is plenty of filling, cheese and sauce). I actually purchased and use a special porcelain covered cast iron lasagna dish made by Mario Batali that is approximately 3 inches deep and is perfect for making deeper lasagnas (it really weighs a lot before putting the lasagna in it and it weighs a ton after the lasagna is actually in it)...but, I absolutely love this pan and wish I would have purchased it a long time ago. I've included a photo of the lasagna below as well as a picture of the lasagna pan I use, and last but not least...the recipe. I promise you that you will find the assembly instructions concise and easy to follow and you won't end up wanting to tear your hair out trying to follow it. Enjoy! A red & green theme is a must for our Christmas meal (the spinach layer adds additional green inside too, along with the fresh basil and Italian parsley). This is the kind of lasagna pan I use...and it's one of the best investments I've ever made! Here is a picture of the pan (I store it in the box to protect it). Here's another perspective...I love this lasagna pan! 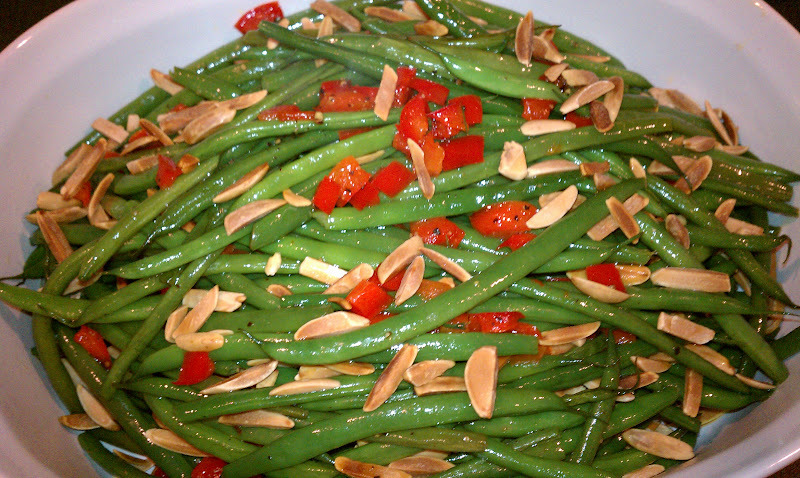 One more thing...to further help you see how important the "red & green" meal requirement is at our house at Christmas...below is a picture of the veggie side dish, Green Bean Almondine I served with my lasagna at Christmas. Actually, this is a beautiful vegetable dish to serve any time of year! These are haricots verts, which are fresh and tender French green beans. To prepare them, I blanch in boiling water for a few minutes and then plunge into a large bowl of ice water filled with ice to immediately stop the cooking and retain their bright green color. Once cooled, I drain the water and set the beans aside on paper towels to drain and dry off. I then dice and saute red bell pepper until crisp-tender and toast slivered almonds in the oven until golden brown. I set everything aside and when it is close to dinner time, I get a large non-stick skillet and melt a few tablespoons of butter and place the blanched green beans in the pan and stir them around heating them up and lightly stir-frying them; then add the cooked diced red bell pepper and toss until everything is heated and the beans are still slightly crisp and also still bright green. I season with sea salt and cracked black pepper, add the toasted slivered almonds and toss together and put in a serving bowl right before serving. They are not only beautiful and "Christmasy" but they are really good too. They make a perfect accompaniment to the lasagna or any other meal no matter what time of year or occasion you serve it. 1. In a Dutch oven, brown sausage and ground beef; add onion, and garlic and continue to cook over medium heat until meat is well browned and onion and garlic are tender. Stir in crushed tomatoes, tomato paste, tomato sauce, and water (or optional red wine). Add: optional sugar, basil (fresh or dried), fennel seeds, Italian seasoning, optional 1/2 teaspoon salt, black pepper, and 2 tablespoons fresh parsley. Simmer, covered, for approximately 1-1/2 hours, stirring occasionally. 2. In a large mixing bowl, combine ricotta cheese with egg, remaining 2 tablespoons fresh parsley, and optional 1/2 teaspoon salt. 3. Preheat oven to 375 degrees. Lightly spray baking dish or pan with cooking spray (like Pam). While you can use a 9x13 inch baking dish, it will more than likely bubble over because it isn’t quite deep enough to hold all the ingredients. I actually use a 3-inch deep lasagna baking dish that I bought just for making lasagna. I’ve also used a stainless steel roasting pan that is approximately 9x13, but much deeper than a tradition 9x13 glass casserole dish. Either of these might work better and spare you extra time cleaning out your oven! · * Sprinkle with 1/2 cup Parmesan cheese. * Top with the remaining third of the shredded mozzarella and remaining 1/2 cup Parmesan cheese. 5. Cover lasagna with foil: to prevent sticking, either spray foil with cooking spray, or use Reynolds non-stick foil. 6. Bake covered in a preheated 375 degree oven for 35 minutes. Remove foil, and bake an additional 25-30 minutes or until heated through and lightly golden brown and bubbly. Cool for 15-20 minutes before serving to allow cheeses to set before cutting. Optional: Sprinkle with fresh parsley and fresh basil to garnish before serving.